Family holidays to Lambi offer easy access to all the amenities of holidays in Kos Town without the wild crowds and lively late night atmosphere. 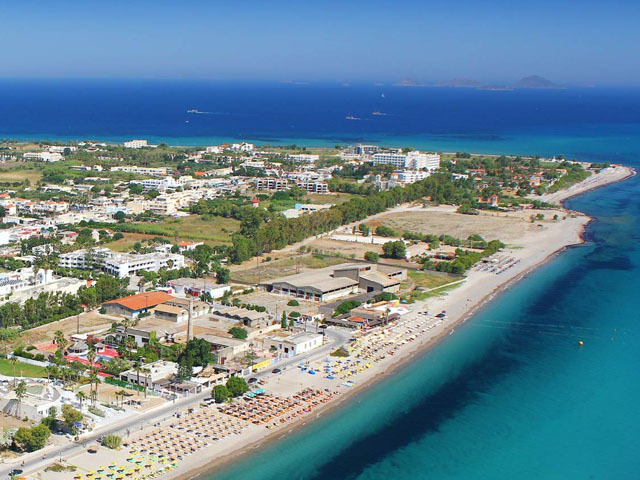 It’s very much like the suburb of Kos Town but allows for the experience of Greek island holidays while offering better package holidays for many families that are looking for calmer and quieter surroundings. Cheap holiday deals to Lambi are the beginning of an excellent holiday experience. Aren’t you ready to get started today? Basically, when you choose family holidays to Lambi you are getting all the benefits and amenities of holidays to the larger resorts without the same degree of hustle and bustle that many, especially those with small children, find off putting.If you want to explore Kos Town though it is a quick 20 minute walk and you are right in the thick of things. There are also bus routes that can be taken advantage of between Lambi and all the major resorts on the island. For beach lovers, Lambi offers what everyone expects from great Greek island holidays, a beautiful stretch of beach. This beach spans the difference from Kos Town to Lambi and is far less crowded than other beaches on the island have a tendency to be. You still have the option of enjoying great water sports along the beach as well as sampling the many restaurants, cafes, and bars that line the beach. Popular water sports that are enjoyed in Lambi are wind surfing, jet skiing, swimming, and para sailing. You should also keep in mind that there are quite a few boat excursions to other islands as well as other resorts on Kos. Don’t forget bus excursions to various points of interest across Kos. There are plenty of exciting things to do, see, and explore during your family holidays to Lambi. Whether you are interested in learning more about the rich history of this region or want to enjoy the greatest crafts and shopping the island holds there are many great places to soak up the sun, the history, and the culture of the small villages surrounding Lambi. Finding cheap holiday deals to Lambi makes all of these things and so much more possible. Don’t forget to check out some of the great package holidays that can save you a bundle on your Greek island holidays to Lambi for your next family holidays.